Design and build workholding for a wide range of applications. 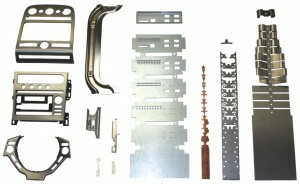 Design and build dies for a variety of industries from automotive to consumer products. We are capable of cutting anything from glass to 9" thick steel. We cut parts complete and also cut parts to be machined later. By waterjeting parts prior to being machined we can get over 30% - 50% more parts from the same size material in turn reducing the piece price of the part substantially.